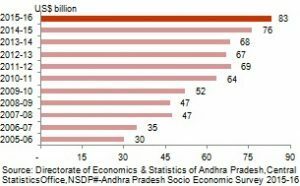 Andhra Pradesh was predominantly an agrarian economy till the early 90s. Over a period of time, the State moved gradually to become a service oriented economywith small incremental growth in the industry sector. About 15 years ago, the Vision- 2020 document envisioned Industry as an important engine to propel growth and provide employment. The State achieved significant improvement in the service sector during the late nineties and the early years of the current century. The manufacturing sector is crucial for employment generation and for developmentof any nation. Historically, the development process witnessed a trend of peopleshifting from farm to non–farm sector such as manufacturing or services. Since independence agriculture contribution hascontinued to decline both at the state and national level. During the period 1993-94to 2003-04 industrial contribution rose marginally at national level by 0.87% while itrose more substantially in AP by 1.74 % despite the lack of industrial culture in thestate prior to 1995. However, subsequently from 2003-04 to 2013-14 the state couldnot consolidate the gains made earlier and in fact lost momentum despite the goldenopportunity presented by a vibrant economy and buoyant revenues.As a result theindustry sector in the state decelerated and its share fell from 24.11% to 23.61%. The year 1991 was a significant year in modern India’s economic history as itushered in economic reforms. Similarly the year 1995 was the beginning of a newera for transforming Andhra Pradesh into a modern economy. The state focussed onkey growth engines identified by reputed experts with global knowledge andunderstanding. These growth engines included industry, infrastructure, horticulture,tourism, IT, services to name a few. A dynamic ecosystem that has certain keyfeatures like good policy which is transparent, good governance systems, supportivetechnological institutions and above all a committed and visionary leadership werecrucial ingredients in this process.As a result, the State was able to make rapidstrides in various sectors despite certain adversities like a series of droughts duringthis period. Average growth in Andhra Pradesh’s economy at constant prices (adjusting for inflation) witnessed a decline from 6.6% in 2005-10 to 4.9% in 2010-15. Figure 1 shows the growth rate of individual sectors in the period between 2005-10 and 2010-15. Over 2005-15, growth rate in all three sectors of the economy, i.e. agriculture, manufacturing and services saw a decline. The growth in the manufacturing sector has slowed down from 8.9% to 3.5%. The growth in the services sector has also slowed down, from 9% to 7.2%. Agriculture growth rate declined marginally from 6.3% in 2005-10 to 6.1% in 2010-15. Agriculture is the most important sector of Andhra Pradesh’s economy. About 55 percent of the population works in agriculture, and the state is one of India’s main rice-producing areas. Other important crops are sugarcane, oilseeds, beans, and pulses (edible seeds from crops such as peas, lentils, d beans). Since Indian independence in 1947, the state government has worked to extend irrigation from the coast to the drier interior by building canals and dams. The Godavari and Krishna rivers today irrigate 6 million hectares (14.8 million acres) of farmland. The NagarjunaSagar project on the Krishna River, completed in 1960, is one of the largest irrigation projects. It has 800 km (497 sq. mi) of canals feeding an irrigated system that produces rice and other crops for industries processing agricultural products. Forested areas, which cover about 23 percent of Andhra Pradesh, yield timber products such as teak, eucalyptus, cashew, casuarina, softwoods, and bamboo. The State government has prepared plans to make Andhra Pradesh a world ‘aqua hub’ by increasing fish production from 25 lakh tonnes (February 2017) to 42 lakh tonnes with a GVA (Gross Value Added) of Rs. 80,000 crore by 2019-20. The Planning Department has given an important place to fisheries in the socio-economic scenario of the Sunrise State. Fisheries have been identified as a growth engine. AP ranks first in total fish and shrimp production and contributes more than 70% of cultured shrimp produced in the country. The State ranks third in global shrimp production (0.3 million tons) and sixth in aquaculture production (1.57 million tonnes). Andhra Pradesh is contributing 1.19% of global and 20.77% of national fish production (2014-15), according to the Socio Economic Survey 2016-17. It is going to establish and manage fishing harbours and fish landing centres at all feasible coastal villages under the PPP (Private-Public-Partnership) mode. A policy framework for allotment for marine areas and large reservoirs for cage culture through fishermen cooperatives or private participation would be developed soon. built up largely since 1947, include steel, shipbuilding, machine tool manufacturing, pharmaceuticals, heavy electrical machinery, fertilizers, cement, chemicals, sugar refining, and jute processing. Andhra Pradesh also has important mineral deposits, including coal, natural gas, asbestos, barites, copper, mica, and iron ore. The state is also the site of the Golconda mines, where the famous Koh-i-noor diamond (now one of the British crown jewels) was found. Tourism is of growing importance to the economy. Andhra Pradesh has an extensive road and rail network, a major port in Vishakhapatnam, minor ports in several other cities, and airports at Hyderabad, Tirupacthi, Vijayawada, and Vishakhapatnam. Tourism is one of the growth engines for economic development of a nation. AndhraPradesh with its rich natural and historic heritage always had the potential to be animportant tourist destination. Till 1994, the State never accorded priority to Tourism.VISION 2020 document envisaged Tourism as a Growth Engine with great potentialfor creating employment for the youth and generating revenue for the State. While aninvestment of Rs 10 lakhs creates 18 jobs in manufacturing sector, 45 jobs inagriculture sector whereas the tourism and Hospitality sector creates 78 jobs. Hencethe Government, very rightly gave emphasis to tourism with a view to harness itsmultiplier effect on employment, economic growth and poverty alleviation in anenvironmentally sustainable manner. Several important tourism projects likeBeach Resorts in Visakhapatnam and Machilipatnam, tourism resorts in Araku,Talakona, Horsely hills, development of Belum Caves, and several other projectswere completed. The State was able to develop several religious destinations,conduct several cultural festivals besides improving infrastructure through theTourism Development Corporation. The key to tourism success in Andhra Pradeshwas its sustained marketing efforts and creation of new tourism products. In the mid-1990s, when the IT boom was just starting, the state capital whichhad a laid back approach was slowly transformed and the creation of cyberabadmade it one of India’s premiere information technology and IT-enabled service hubs.The state capital region acquired a reputation as the Silicon Valley of India as a largenumber of IT firms had set up their operations there. Starting in the 1990s, duringthis phase, many of the IT MNCs Like Microsoft, Oracle, Dell, Deloitte, HSBC,Computer Associates, Covergy’s, Bank of America, CSC, TCS, Infosys, InfotechEnterprises, Satyam, Verizon have initiated their operations in Hyderabad. Andhra Pradesh generates huge quantities of raw material resource which canpromote leather sector. AP provides 10% of India’s raw material. However, it couldtan only 5% of the raw materials due to lack of tanning facilities. The balance 95% ofraw material is being transported to other States for value addition. Realising thissituation, the government in 2001 had lunched ‘Malupu” program for promotion ofleather sector in the state. Under this scheme, 94 leather parks consisting of 72 Mini,16 Medium and 6 mega leather parks were proposed covering all the districts. InPhase-I, buildings were constructed for the parks with an amount of Rs. 2.81 croresand footwear machinery was provided to 10 Mini Leather Parks. The objective of theAction Plan was to the train leather artisans who were mainly from the Scheduled. Castes community to form into Self Help Groups (SHGs) and run the parks. Howeverthe Government in subsequent years neglected the leather sector. Even theInternational Leather Park at Krishnapatnam has not made any progress since 2006.